“Gage” is a 10 year old male, neutered Labrador Retriever with a chronic anterior cruciate ligament tear of his left rear leg. The leg was surgically repaired using a lateral fabellar tie back technique. The animal’s surgical recovery was complicated by poor at home care and the stabilization of the joint capsule was not achieved. 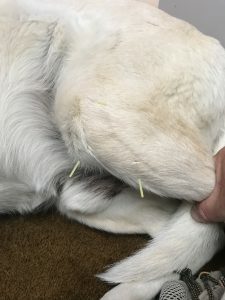 “Gage” has been treated intermittently with anti-inflammatories, and now acupuncture as of May 15, 2018. 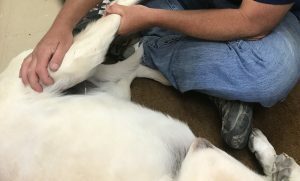 We have been able to remove all anti-inflammatory medication since starting the acupuncture treatment, which is currently being done every 2-3 weeks. “Gage” is a 10 year old neutered yellow Labrador Retriever that presented in August 2016 for acute rear left leg lameness. His past medical history up until that time was unremarkable. He was current on all recommended vaccinations, deworming, flea/tick preventative. ‘Gage’ has been treated intermittently since 2016 with 75 mg Rimadyl twice daily as needed to help with the pain in his hind leg. On May 15, 2018, I asked the owner of “Gage” if I could perform a myofascial exam and acupuncture and monitor his response to treatment. On May 15, 2018, “Gage” presented bright, alert and responsive. Temp 101.4 degrees. Pulse 75 BPM. Respirations 15 per min. Mucous membranes are Pink. Capillary refill time was less than 2 sec. Gage was chronically grade 1-2/5 lame on his left rear leg due to his previous ACL tear in 2016. His neurological exam was normal, other than his proprioception on his left rear leg was mildly decreased. Knowing that he has a torn ACL, I would suspect he could have traumatized some of the mechanoreceptors in the region of his stifle. He could also have some sort of cord injury in the region caudal to T-3. It would also be possible he has a peripheral nerve injury, muscular or myofascial pain while placing the foot. Any peripheral nerve disease, and some central nervous system diseases could cause decreased proprioception. A myofascial exam was performed. His cranial cervical paraspinal muscles on his left side were very tight. His longissimus muscle in the region of his caudal lumbar region were moderately painful and tight upon palpation. Tight bands and trigger points were noted in multiple locations in his longissimus muscles. Flexion and extension of his left knee was decreased, with moderate amounts of crepitation felt. The region of the joint capsule felt thickened mildly painful. His semimembranosus and semitendinosus muscles were tight and with bands present. These muscles were affected bilaterally. The muscles on the right leg may be affected because this leg has to compensate for the chronically decreased use of the left leg. More weight has typically been applied to the right leg. The left leg has not been anatomically normal in quite some time. The knee joint has not had a normal range of motion, the hind leg muscles have not had a full range of motion either. I feel the combination of a chronic pain response and altered anatomical function of the left leg contribute to the bands and tightness in these muscle. A central nervous system issue, as well as a peripheral neurologic disease could cause possible pain, weakness, and neurological dysfunction of the hindlegs. In having dealt with this case since 2016, and having done the original diagnostics on “Gage”, I was confident of my original diagnosis of a torn anterior cruciate ligament. Upon presentation on May15, 2018, my differentials for a grade 1-2 lameness that has persisted since surgery include: thickened joint capsule of knee, post-surgical implant irritation, osteoarthritis of knee, hip pain, stifle pain, joint instability, and secondary muscle pain due to chronic compensation of abnormal knee movement. “VINDICATE’ rule-outs for persistent unilateral hind limb lameness would have to include joint septicemia, any systemic autoimmune disease, soft tissue injury(sprain, strain) to the immediate soft tissue structures of the knee, soft tissue injury to any of the muscular or tendinous areas of the hind leg, tumor, trauma, osteoarthritis, hip dysplasia, fracture, a possible congenital abnormality, or any iatrogenic cause. A central or localized peripheral neurologic disease process would have to be on a differential list. A definitive diagnosis of osteoarthritis secondary to a chronically torn ACL was made via digital radiographs. Palpation of the knee showed thickening of the joint capsule of the knee. The myofascial exam showed multiple muscular regions with trigger points and tight bands. The next time I examine this animal, I will repeat my complete myofascial exam, paying more attention to the neck and back regions. I have a tendency to zero in on the immediate area of concern and not step back and examine the entire animal. I continue to work on this. My point selection from a peripheral nervous system standpoint for stifle pain could include ST-34, ST-35, ST-36, SP-6, SP-9, SP-10, and BL-40. From a CNS standpoint, I feel I could include BL-54, BL-27, BL-28, and GB-30. In regards to the neck pain, I feel from a CNS standpoint I could consider BL-10, BL -11, GV-20, and GV-14. From a peripheral standpoint, I need to consider SI-3 and BL-60. Any local trigger points along the neck should also be considered. In regards to the somewhat diffuse lumbar pain in the longissimus muscles, BL-17, BL-18, BL-19 should be considered for the mid-thoracic spinal nerves that may be causing issues. BL 20, BL-21, BL-22, BL-23, and BL-25, as well as GV 3, GV-4 will be tried as CNS points so the caudal thoracic and thoracolumbar spinal nerves in the region of the lumbar pain may be affected. From an autonomic nervous system viewpoint, ST-36, GV 14, GV-20, and Bai Hui would be of benefit. Point Rationale- ST-34 was chosen to oppose SP-10 to affect the femoral nerve as well as the Golgi tendon organs to help relax regional muscles.ST-35 will help affect local knee structures including the patellar ligament and bursa. ST-36 was a primary point chosen for several reasons. This area contains many mechanoreceptors and lateral genicular anastomosis of arteries and veins. Parasympathetic stimulation from ST-36 can affect the whole body because somatic afferent stimulation reaches the brainstem at the nucleus tractus solitarius and thus stimulates vagal parasympathetic activity. This is because the nucleus tractus solitarius is in close proximity to the vagal nerve. The parasympathetic system will pro-anti-inflammatory. SP-9 was chosen as it is commonly paired with SP-10 and ST 34,35,36 to affect the stifle proximally and distally, as well as medially and laterally. HT-7 was chosen as a calming point. HT-7 neuromodulates the parasympathetic system due to parasympathetic nervous system due to the regional vascularity involving the ulnar vein, artery and nerve. BL-40 was chosen because it is the master point for the lower back. It involves the tibial nerve and thus the flexors of the foot. BL-10 was chosen due to the cervical neck pain present. All points were dry needled. Laser and electrostimulation would be very viable options for this animal, but I do not have the needed equipment to do so. I have recently purchased an Ito E-stim unit and will begin using it soon. I am trying to incorporate more massage into treatment protocols while also utilizing acupuncture. “Gage” responded remarkably well to the acupuncture. He was still on anti-inflammatories at the time of the first treatment. We took him off of the medication after the first treatment to see how he responded. He walked with less of a ‘stifled’ gait. He went from a grade 2-3 lameness to a grade 0-1, depending on factors such as amount of activity and weather. The cranial portion of his stride has increased significantly. Overall, the dog is more active, acts less painful, and is much more apt to exercise and play more. I do feel acupuncture is the primary reason for his improvement, as he is on no other medication and I strongly suspect he has a moderate amount of degenerative joint disease present in the stifle. ‘Gage’ will begin to become less active and limp more severely approximately 3 weeks after a treatment. We currently acupuncture him every 3 weeks.